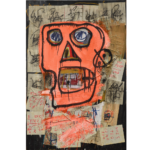 Staying with Scott Reyburn’s story in Bloomberg previewing the Contemporary art auctions, the overall mood of the sales is restraint. Dealers and experts alike are looking for an orderly retreat to a more stable and manageable market. Though “anchoring,” the behavioral psychological idea that sellers are reluctant to let go of price once it gets fixed in their minds, remains a serious issue. Westphal said she hoped the auction would help establish new pricing for contemporary art. “We’d like people to say, ‘The damage has been done, this is the market now, let’s move on from this,’” said Westphal.